Miles Delivers Street Stock Win with Sons Watching; Marcum, Gossar Return to Victory Lane - Anderson, Indiana Speedway - Home to the World's Fastest High-Banked Quarter Mile Oval! With his twin 3 year old sons watching from the grandstands at Anderson Speedway, Bret Miles Jr. survived four restarts to win the CRA season opener for the Street Stock Division. The Muncie native started sixth in the field on Saturday on Talecris Plasma Resources night and ran in the top five for the entire distance. 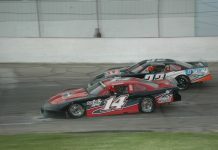 Tyler Marsh took the early lead from the pole position and through five restarts was able to hold off Andrew Teepe. On a lap 21 restart Miles got inside of Teepe in turn one to claim the second spot and four laps later got underneath Marsh exiting the fourth corner to take the point. Brett Hudson passed Teepe on lap 48 entering turn three and started to chase Miles. The eighth caution flag waved on lap 53 for a spin by Jacob McElfresh after contact with Jason Atkinson and the final yellow waved on lap 68 when Jordan Hahn looped it on the back straight following contact with Danny Adams. Despite the caution flags Miles went on to win by less than three-tenths of a second over Hudson followed by Teepe, Marsh and Josh Poore. Over the final seven circuits Hudson kept the pressure on Miles and several times bumped him in the corner hoping to gain the lower groove. In the CRA Sportsman Late Model season opener three-time Anderson Speedway champion Jeff Marcum scored his third win in four races. The early lead was taken by Aaron Pierce, who was eventually black-flagged by CRA officials for jumping the initial start. That gave the lead to Marcum on lap nine and for most of the remaining laps was chased by Tommy Cook who claimed the second spot from Billy Hutson on lap20. During several restarts Cook could stay close to Marcum, but the track champion would pull away from the competition as the laps diminished. Marcum won by 2.4 seconds over Cook, with Hutson, RJ Norton Jr. and Zachary Tinkle rounding out the top five. In other racing action: Trent Gossar led all 30 laps to capture the Vores Compact Touring Series feature. At the finish he was chased by new track record holder for the division Tom Gossar Jr., Gary Eaton Jr., Terry Eaton Jr. and Todd Mertz Jr.